For much of the middle 1900s consumers coveted sheets of little green stamps. Known as S&H Green Stamps, they came in a variety of point values and could be redeemed for household items. 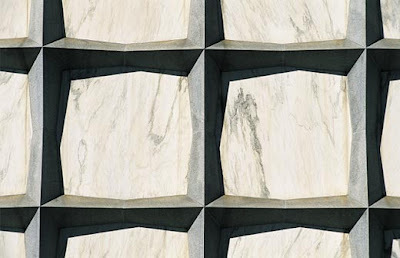 Now mostly forgotten, the popularity of S&H stamps led to one of the great uses of marble as a building stone, when in 1960, the Beinecke family, owners of the Sperry and Hutchinson company, decided to donate the money for a rare book library at Yale. 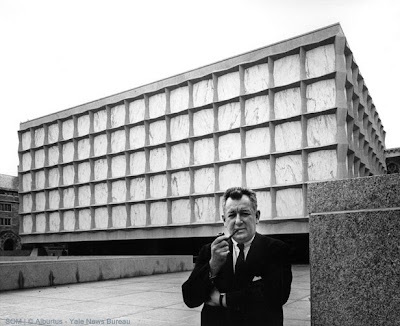 They decided to go for marble but even then Bunshaft had troubles. For example, marble from the quarries that provided stone for the Acropolis “looked characterless, like a lampshade,” and that wouldn’t do. Finally an old man from Vermont told him about marble from a quarry in Danby, Vermont. The stone wasn’t perfect. It was a “last, desperate thing…too strongly veined when you see sunlight coming through inside. It’s too yellow and black.” But it would do. Each panel measures 54 x 54 inches and is 1.25 inches thick. Frames of light gray granite from Vermont hold the marble panes in place. The Danby marble is one of several varieties of Shelburne marble, which formed from metamorphism during the Early Ordovician Taconic Orogeny. Other trade names include Royal, Imperial, and Dorset. I was lucky enough to visit the library several years ago. Although the exterior is a bit dull, warm light suffuses the interior. I disagree with Mr. Bunshaft, I like the richness of the amber hues of the stone. I didn’t know whether to be more awed by the wonderful books, such as a Gutenberg Bible, or the wonderful stone. 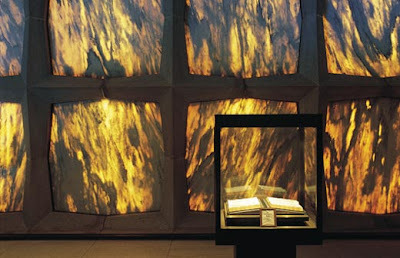 If you do have the time, I highly recommend visiting the Beinecke Rare Book Library at Yale. Previous Previous post: The Duomo and the Dinosaur: Not?